Racing driver Paul O’Shea won his second title as US sports car champion in the 1956 season driving a Mercedes-Benz 300 SL Gullwing. When the season ended on December 28, 1956, he was champion in the category D Production and had scored the most points in the National Sports Car Championship of the Sports Car Club of America. He went on to defend his title again the following year, this time driving a Mercedes-Benz 300 SLS, the racing version of the 300 SL Roadster. On January 23, 1957, the New York Times reported that Paul O’Shea was awarded the title of National Sports Car Champion for the second year running. This was at the same time a triumph for Mercedes-Benz, because since 1955 the racing driver born in 1928 had been competing with works support in the 300 SL production sports car. The championship title was informally awarded by the news media. The SCCA only honoured the champions in the individual categories. In 1956, O’Shea won the racing class D of the production vehicles. To crown the winner among the champions of the racing classes, the newspapers and magazines counted the highest number of total points achieved by a driver in a season. In 1955, O’Shea became the first winner of the title awarded in this way as part of a PR campaign with 11,750 points, and played a role in making this the most successful season in motor racing for Mercedes-Benz ever. One year later, he scored 10,500 points by season’s end. The SCCA confirmed this during the official announcement of the results of the season on December 28, 1956. Mercedes-Benz backed O’Shea in the US sports car races to promote the sales of the company’s sports cars in the important export market. Accordingly, the representatives of the company closely monitored in what cars the race spectators arrived: at the Cumberland National Sports Car Race on May 20, 1956, customer service inspector Victor R. Gross counted 100 Mercedes-Benz passenger cars in the parking lot. O’Shea had a great start to his second season as a driver backed by Mercedes-Benz. O’Shea won the D Production racing class, and just a few weeks later he was informally named US sports car champion by the American motorsport specialist media due to having scored the highest number of points. In all, O’Shea competed in 14 races in 1956. In October, the racing driver clearly led the standings for the informal title of National Sports Car Champion with 10,500 points. 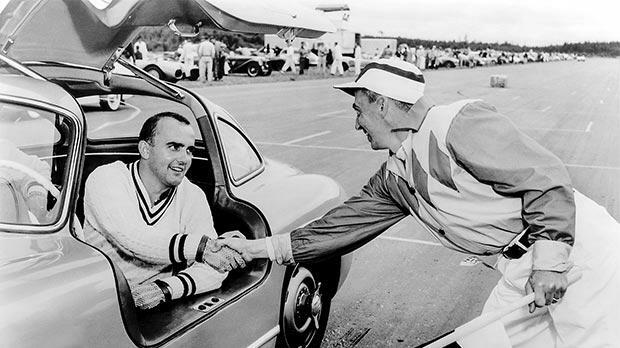 O’Shea was supposed to win American sports car races for Mercedes-Benz again in the 1957 season. Mercedes-Benz also held out the prospect to O’Shea of being hired as a consulting engineer. However, the Stuttgart-based company wanted to use the new 300 SL Roadster for the 1957 season, and not the Gullwing. The new car would no longer start in the D Production class, but rather in the unlimited D Modified class. This gave rise to the Mercedes-Benz 300 SLS, a 300 SL Roadster. The special versions weighed just 970kg and had an engine output of 173kW/235hp (production version: 158 kW/215 hp). O’Shea won the title of US Sports Car Champion for the third consecutive time in 1957.